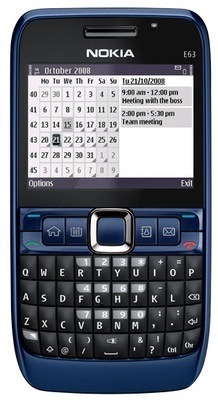 Review Last year, Nokia introduced the E71, a do-it-all smartphone clearly modelled on recent examples of the Qwerty-keyboard toting BlackBerry. Unlike many other would-be BlackBerrys, it proved to be a worthy rival, with a solidly functional keyboard, fault-free push email, 3.2Mp camera, A-GPS, HSDPA 3G and Wi-Fi, all in a slimline package. The E63 misses out on a couple of functions, but basically it's a cut-down version of the same phone. The first evidence of scaling down is the casing. Where the E71 has a solid metal shell, the E63's is all plastic, shiny on the front, and a tactile, matte finish on the back. Practically, there's little difference, since the E63 is only a gram lighter than its cousin, and while the E71 might feel like the sturdier model when the two are held together, the E63's sturdy plastic doesn't feel like a sell-out. If anything, the warmth and tactile appeal of the slightly rubberised plastic is an improvement on the coldness of the E71's metal. At 113 x 59 x 13mm, the E63 is a couple of millimetres wider and thicker than its predecessor which, if anything, helps it slightly with the greater room afforded the Qwerty keyboard, which is spectacularly easy to use either with one or two thumbs. The keys are of the same rubberised plastic and raised in the middle - making them nice and easy to identify and grip - but also slightly larger those on the E71, which raises the ease of use score, without sacrificing much in the way of pocketability. The four-line, 39-key layout is actually more practical than that seen on recent BlackBerrys like the Bold 9000 or the Curve 8900, since you can access important characters like the full stop and @ with a single press - though the greater spacing on the BlackBerrys means it's easier to text without looking at the keyboard. Above the keyboard are a square navpad - sadly, it doesn't double as a touch-sensitive clickwheel - flanked by four 'one-touch' keys which act as shortcuts to the home page, the diary, contacts list and messaging apps, as well as call start and stop and two soft-menu keys. Stop now doubles up as the power button, as it has been with almost every manufacturer except Nokia for ages.